While some people simply brush off certain indecencies, others become very bothered by them. Being undermined is something many of us have encountered, but to some it is extremely upsetting. 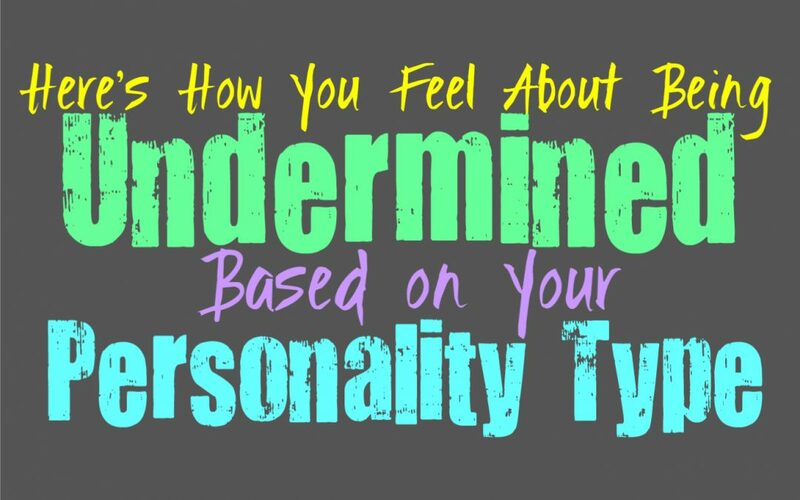 Here is how you handle being undermined, based on your personality type. INFJs definitely don’t appreciate being undermined, and often feel instantly flustered by this. They might openly express their feelings at first, since they try to avoid discord. They especially become frustrated when someone undermines them in the workplace, since they often feel like they have to bite their tongue. INFJs don’t appreciate this type of attitude, and will likely want to avoid being around that person entirely. Once someone decides to undermine others the INFJ likely writes this person off rather quickly. ENFJs definitely don’t handle being undermined well, but they will often try to pass it off. They often attempt to change the subject or maybe even make a joking comment in response. ENFJs don’t like discord, at least not where it should be avoided. At the same time someone who continues to undermine the ENFJ or someone they care for, will eventually see a different side of them. They believe in respect and don’t enjoy being around people who have no sense of respect for others. INFPs definitely don’t appreciate being undermined and often feel the need to avoid people who do this. They believe in giving people the freedom to be themselves without constantly putting them down for their differences. While INFPs seem like sweet and quiet people, they have a fiery side to them. If they continuously have to deal with being undermined, they will definitely express their frustrations. At first they will likely be passive aggressive in order to release their annoyance, eventually they will openly express that they have had enough. ENFPs really don’t handle being undermined well at all, and will likely express their disdain. When someone acts superior to the ENFP they will likely shut them down immediately. Even in a workplace ENFPs don’t really accept someone disrespecting them in this way, and will make it pretty evident how they feel about it. They can often do this in a clear way that doesn’t come across as rude, they simply don’t like being pushed around by people who think it is acceptable to do this. INTJs definitely don’t just sit back and allow people to undermine them, and will find this behavior extremely frustrating. They aren’t afraid to stand up to people who behave this way, since INTJs definitely believe in respect. They will likely approach the situation by proving that this person undermining them is wrong and showing just how capable they are actually are. INTJs are intelligent and focused people who often amass a lot of knowledge, which makes it rather annoying when someone acts superior to them. They will shut this person down by proving how much they know, and by challenging them in an intellectual manner. ENTJs really don’t handle being undermined well at all, and will make a stand against this. When someone attempts to make the ENTJ feel inferior, they often take this as a challenge. They will stand up to this person and prove just how capable they actually are. ENTJs take on people like this and attempt to prove them wrong, since they believe in putting their arrogance in their place. ENTJs don’t like being pushed around and definitely don’t just accept this. INTPs become frustrated when someone undermines them, but they often try to observe the situation before reacting. They definitely don’t appreciate this type of behavior, and will likely consider their options about how to proceed. When someone undermines the INTP they likely find a way to shut them down, even if this means doing it in a way that is a bit embarrassing. INTPs simply don’t allow someone to continue this behavior, especially when they do it to others as well. ENTPs often take someone undermining them as a challenge in some ways. They become annoyed with this behavior, but they often want to prove this person to be a bit foolish in front of others. The ENTP will likely stand up to them by using their own knowledge and information in the form of a debate. They are often good at finding the right words in order to convince others just how right they actually are. ENTPs simply don’t like allowing people to behave this way, especially when they are consistently trying to undermine others. For ISTJs being undermined is definitely frustrating, but they will try to brush it off in a work situation. They dislike having to deal with drama, so they attempt to move forward in many situations. When they are continuously undermined though, the ISTJ will feel like they need to handle the situation. They often set their boundaries very clearly, and believe in a certain level of respect. When someone continues to undermine them, the ISTJ will clearly tell them they do not accept this, and will set their boundaries in front of them. ESTJs definitely don’t handle being undermined very well, and will clearly stand up to the person who does this. They might turn it into a joke at first, passive aggressively responding with some comment to prove they won’t back down. If the line continues to be crossed then the ESTJ will definitely stand up to this individual. They don’t allow people to push them around and are comfortable standing up for themselves in these situations. ISFJs are not fans of being undermined, but at the same time they dislike causing trouble. They will likely try to avoid this type of person, simply because they want to maintain the harmony in their environment. ISFJs will try to calm the situation down instead of starting an unnecessary argument. When someone continues to undermine them the ISFJ will likely want to disconnect from this person completely, instead of causing trouble with them. ESFJs don’t like being undermined, but they also dislike creating discord. When someone undermines them they will likely try to brush it off at first, unless this continues to happen. They will likely speak their peace and explain that they aren’t okay with this type of behavior. ESFJs often try to bury their feelings at first, until they cannot do this any longer. When this happens they can sometimes explode a bit, causing their response to more intense than they would have preferred. ISTPs don’t appreciate being undermined but they often handle it fairly well. When someone does something like this a first time, the ISTP often brushes it off. They don’t get too hung up over the actions of others, unless they are someone truly close the ISTP. If the same person continues to undermine them, they will simply shut them down and explain that they are aware of what this person is doing. ISTPs are great at using facts and information in order to shut others down perfectly. ESTPs definitely don’t like being undermined and often take this as a bit of a challenge. When someone tries to act superior to the ESTP they often use a long list of facts in order to shut them down. They remember information for a long time which helps the ESTP prove others wrong in many situations. They will use these facts and pieces of information in order to stand up to someone who attempts to shame or undermine them. While ISFPs don’t appreciate being undermined, they often attempt to walk away from these people. They try to let these feelings slide off their back, instead of holding onto them. ISFPs would rather focus on living in the moment instead of constantly getting hung up on negativity. ISFPs enjoy being able to live their lives with purpose, and will follow their hearts instead of being held back. ISFPs who are being undermined will likely try to walk away from the situation and the person doing this. ESFPs don’t appreciate being undermined, but there are times when they won’t even notice it. They try not to get hung up on negativity and prefer to focus on living in the present. ESFPs love being able to be around positive people, especially the ones who care for them. When someone undermines the ESFP they will likely brush it off, until this continues to happen over and over again. When this occurs the ESFP will stand up to them and express just how frustrated they actually are. They can be emotional when they express these feelings, simply because they want to feel respected.